When it comes time to plan prospecting trips abroad for the purpose of finding a suitable expatriate country, chances are, unless you’re experiencing Jack Kerouac flashbacks, you’re going to fly on a commercial airline, which can be expensive. Unless you’re literally made of money, don’t run out and book the first flight you find. 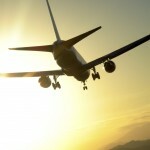 There are simple, legitimate ways to reduce airfare. Here are a few. For international flights, you should book at least 30 days in advance for best fares. Here’s a sample. The simple act of planning ahead lops more than 50% off your airfare costs. Why, oh why, would you wait until the last minute and then pay those exorbitant rates? This doesn’t mean you should take a yoga class before boarding, though that might not be a bad idea, considering the effects of an umpteen hour flight inside a sardine can. What we mean is be flexible with your travel dates. If you insist on traveling on a particular day, chances are good you’ll pay a pretty price for it. Most third party travel aggregates allow this function when you search. Here’s a example we found. That’s a huge savings for simply being a little bit flexible with your plans. There are other tricks we’ll get into at another time that will save you big chunks of money when you fly, but focus on these two the next time you book flights and watch how much money stays stubbornly in your pocket rather than jumping into the airline’s account.